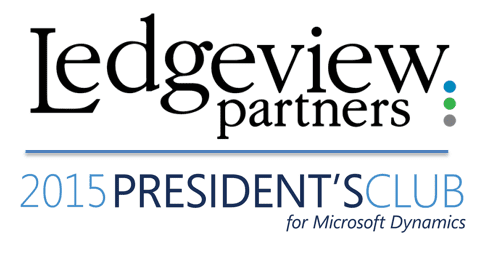 Ledgeview Partners, a Microsoft Dynamics CRM Gold partner, has been named to the 2015 Microsoft Dynamics President’s Club for the sixth time in company history. This achievement is a direct result of Ledgeview Partners’ outstanding dedication to customer satisfaction through the delivery of innovative business solutions. The Microsoft Dynamics President’s Club honors high-performing Microsoft Dynamics partners with commitments to customers that are reflected in their business success and growth. This prestigious group represents the top 5% of Microsoft Dynamics partners worldwide. Membership is granted based on their continual, committed efforts aimed at offering solutions that meet the needs of their customers. This acknowledgment came during the 2015 Microsoft Worldwide Partner Conference (WPC), the company’s annual premier partner event, which took place this year in Orlando, Florida. WPC provides Microsoft Corp.’s partner community with the largest opportunity to learn about the company’s road map for the upcoming year, establish connections, share best practices, experience the latest product innovations and learn new skills. Lisa Benson, President of Ledgeview Partners adds “We are honored to receive this award from Microsoft. Our dedicated team works hard to help our customers achieve their business goals with Microsoft Dynamics CRM. Receiving this recognition for the sixth time is a continued celebration of those efforts”.